The Indian and Bangladeshi Food Festival was run at the BlueGinger from 13 - 15 May. There were 30 items from the menu available as a buffet, all day Sunday and on Monday and Tuesday evenings. The 350 customers were able to try as many of the dishes as they liked for just £10. So it was an ideal opportunity to sample some of the Bangladeshi dishes not found in mostIndian restaurants. As a central attraction, a whole lamb was roast to provide the meat for the lamb dishes. So successful was the event that on the Sunday there were queues as guests stayed on beyond the length of time expected. MP Sir George and Lady Young came to sample the fare. Mohammed Mustak, the restaurant's proprietor, made good his promise to donate any profits to the Mayor's Good Cause on 12th June when he handed over a cheque for £500 to Cllr Steve Robbins for the Whitchurch Youth Project. Keith Watts, for the Project, thanked Mohammed for the very generous donation and Working for Whitchurch, which had worked with the project and the restaurant to make the event the success that it undoubtedly was. The funds will go towards the costs of renting sports facilities at Testbourne for the Project. 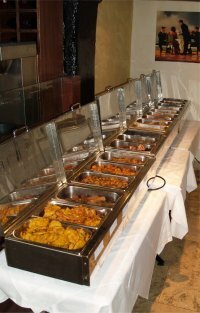 The event has been such a success that the Blue Ginger is now offering a buffet meal all day every Sunday.